The Hamboards Classic is a large handcrafted longboard measuring in at 6'6" x 15". From the moment you step on The Classic, you feel the range of flex the S8 torsion trucks from Original Skateboards allowing you to manipulate the board to feel like you're shredding a longboard. With minimal force the board gets rolling and maintains momentum with top of the line 97mm Flywheels and BILTIN Abec 7 bearings. Once you get cruising on the Classic you can maneuver the board like a surfboard shredding the concrete, cross stepping, carving, and even sliding the tail around for a fast snap. Grab the StreetSweeper land paddle and go for a land paddle like you never have before. With the 15" wide deck you can face forward just like a SUP and feel the board rock side to side as you work on your stabilizer muscles and improve your core. Quality is number one at Hamboards. Every board is handcrafted in the US surfing capital Huntington Beach, CA. Hamboards is only interested in using the best products from the industry coupled with 100% "Green" renewable bamboo to give you the ultimate surf skateboard. 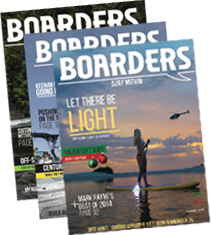 We give Hamboards the Boarders Mag Seal of Approval!